Receiving reader mail whether is it snail mail, email, or a tweet is one the most fun things about being an author. I especially love the mail that tells me how much the reader loved my characters. For me, the most important part of the story is the characters. Even as a reader, it is the characters that make me fall in love with novel. 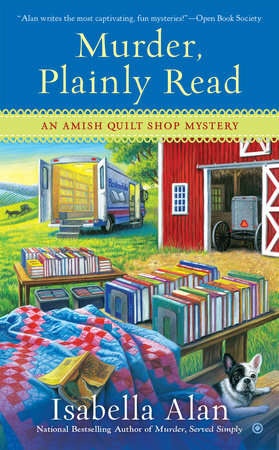 After the release of Murder, Simply Stitched, the second book in the Amish Quilt Shop Mysteries, I received a flood of reader messages saying how much they loved Petunia the Nubian goat, who knocked my main character Angie Braddock back on her behind every chance that she got. But then after the release of Murder, Served Simply, the third book in the series, I got just as many messages asking me where Petunia was and if she would return. Since I love Petunia myself, I decided to put her into the main cast of characters. So back by popular demand Petunia the Nubian goat returns in Murder, Plainly Read. The trick of Petunia’s triumphant return was deciding where to put her. In the second novel, she belongs to a murder suspect who doesn’t appear in any other books and wouldn’t fit into another plot. My only choice was to have one the main cast adopt Petunia. Jonah Graber, a friendly Amish man who is Angie’s best childhood friend, was the perfect choice. Always looking for new business ventures, Jonah would want a goat to start his new goat lawn service business, a business where goats are used to clear land for farming. Also Jonah, being the nice guy that he is, would not hesitate to take in a homeless goat. Angie, who loves Petunia in her own way, is happy that Petunia is back too. She’s just not looking forward to the bruises that she will receive from being knocked over again and again by Petunia. Being toppled over by Petunia’s head butts might give Angie bruises, but it sure keeps the readers and me laughing, which is all I ever want as a writer. USA Today Bestselling Author Isabella Alan is the pseudonym for Amanda Flower. Amanda Flower, a three time Agatha-nominated mystery author, started her writing career in elementary school when she read a story she wrote to her sixth grade class and had the class in stitches with her description of being stuck on the top of a Ferris wheel. She knew at that moment she’d found her calling of making people laugh with her words. Amanda is an academic librarian for a small college near Cleveland.